Two thirds of our planet is covered with water. Much of the water is found in lakes, rivers, and oceans. Water exists on our earth in three forms: solid, liquid, and gas. The water in lakes, rivers, and oceans is in liquid form. However, every day some of this liquid turns to gas. As the sun shines, some of the water evaporates. Evaporation means turning from water to water vapor. What happens to the water vapor in the air? Some of it mixes with the air near the ground. Some of it rises into the sky where the air is cooler. In this cooler area, the water vapor turns back into little droplets of water. This is called condensation. The droplets of water form clouds. As the water droplets get larger and heavy they fall from the clouds as rain. Or if it is cold enough, snow. This is called precipitation. Rain and snow are the most common forms of precipitation. 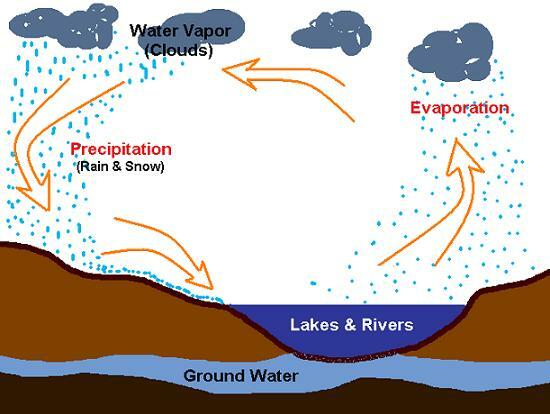 Evaporation, condensation, and precipitation form what is called The Water Cycle. The Water Cycle never stops. It goes on and on. It happens over and over again. Directions: Answer the questions about The Water Cycle.